9 October 2010 – Four Seasons Resort Maldives at Landaa Giraavaru was honoured to welcome the President of the Maldives, Mohamed Nasheed, on October 9, 2010, to inaugurate the Resort’s pioneering Marine Discovery Centre (MDC). 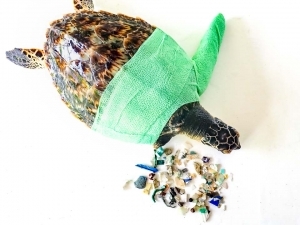 The MDC showcases the Resort’s different environmental projects, including coral reef propagation, manta ray conservation, and fish culture, and is run in partnership with Maldivian environmental consultancy, Seamarc Pvt Ltd. Accompanied by his family as well as several Ministers and Members of Parliament – including Mohamed Aslam, Minister of Housing and Environment, and Ahmed Naseem, State Minister of Foreign Affairs – President Nasheed officially opened the centre by saluting the Resort’s efforts and the dedication of the marine research team. He then spent time with the marine biologists, planted a coral frame and snorkelled in the Coral Garden to see the work of the Reefscapers – one of the most successful reef propagation projects of its kind in the world. The Maldivian Democratic Party also sponsored a large coral frame in support of the reefscaping initiative. 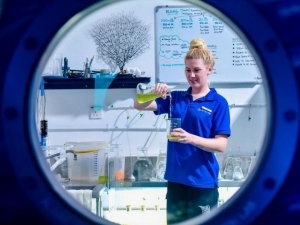 Occupying its own large oceanfront building adjacent to the main jetty, the Resort’s Marine Discovery Centre aims to increase the environmental knowledge of its guests and the local community. 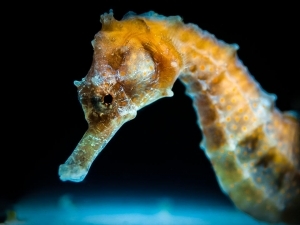 The centre uses multi-language touch screen video kiosks, dramatic photography, exhibition boards, educational talks, life-size models and interaction with marine biologists to educate its visitors about the local marine ecosystem and the Resort’s efforts to conserve it. 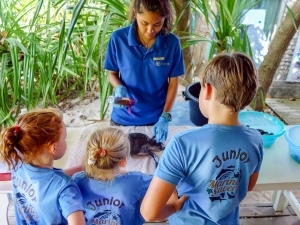 The centre also has a dedicated children’s section with touch tank and interactive activities, and host groups of school children from local islands as part of an extensive outreach program. Reefscapers is Four Seasons Resort Maldives’ coral propagation project. It is one of the most successful of its kind in the world, having transplanted more than 60,000 fragments of coral between 2005 and 2009 alone. It is hoped that the project’s ground-breaking clone selection research will one day lay the foundation for the worldwide use of coral frames to help protect reefs against global warming. Learn more or sponsor a coral frame here. Maldivian Manta Ray Project (MMRP) is the Maldives’ only full-time manta ray research project. Founded by senior marine biologist Guy Stevens – with the support of Four Seasons and Save Our Seas – MMRP has amassed the largest number of identified manta rays on record anywhere in the world, combining new discoveries with active conservation and education. Landaa’s Fish Lab is striving to cultivate a sustainable aquaculture of ornamental fish that can be developed, in time, to create an alternative source of income for local communities. Further exhibition topics include whale sharks, dolphins, shark and turtle conservation.